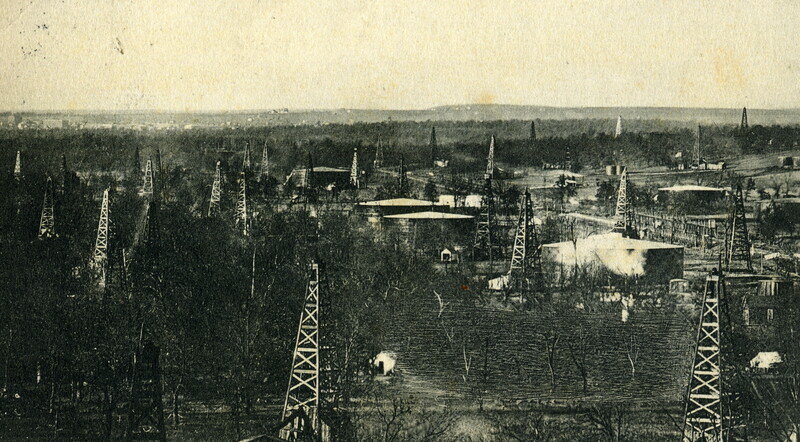 A sales tax exemption approved in 2005 applies to electricity used in “waterflood” oil recovery projects in older fields, such as the Glenn Pool field shown above, circa 1910, with Sapulpa in the distance. The financial cost to the state is not huge. According to the Oklahoma Tax Commission, the waterflood tax break reduced state revenue by an estimated $2 million during the 2013-2014 fiscal year. That’s only a drop or two of the estimated $901 million budget hole currently facing state lawmakers. The environmental cost appears negligible. Waterflood projects typically recycle well wastewater back into relatively shallow reservoirs to force more oil and water to the surface. The project sites do not appear to correspond with the state’s continuing spate of earthquakes, which have been linked to deeper wastewater disposal wells. Still, the waterflood exemption appears to illustrate the kind of legislative logic that led to enactment of scores of business tax breaks over the years, at a cost to the state of hundreds of millions of dollars. Bingman’s sponsorship of the bill did not appear to violate conflict-of-interest rules because the tax break was made available to all oil companies, not just to his employer. “The ethics rules really don’t apply to that, if it treats everybody in the same class the same way,” said Ashley Kemp, deputy director of the Oklahoma Ethics Commission. The following companies and well sites were granted exemptions from paying sales tax on electricity used to power "waterflood" oil recovery operations. doubted that the exemption had stimulated much, if any, job growth, a primary objective of many business incentives. “It’s an incentive for basically the most marginal economic activity … It’s definitely not going to be a growth industry,” Perry said. The waterflood tax break was created in 2005 during Bingman’s first term in the Oklahoma House. He said he got the idea after talking to colleagues working for small oil companies in northeast Oklahoma, where a number of waterfloods are located. Waterflood projects consume a lot of electricity because they use big submersible pumps to extract water and oil from the ground, and big above-ground pumps to inject wastewater back into producing formations. HB 1498 waived the state’s 4.5-cent sales tax on electricity used to power the pumps, under certain qualifying conditions. Among other things, a project’s crude oil content can’t exceed 1 percent of the total volume of water and petroleum removed from the ground. Companies must apply to receive the exemption. The Oklahoma Corporation Commission determines whether each project qualifies. Once approved, the exemption remains in place even if oil production creeps above 1 percent. So far, seven companies have received approval for 17 exemptions. Uplands Resources received the first exemption in 2007. It applies to a waterflood project in eastern Creek County, not far from Bingman’s hometown of Sapulpa. Bingman said the project involves wells in the old Glenn Pool field, one of the state’s first big oil-producing areas. He said some wells there were drilled as far back as 1905. He said he thought the small companies operating these projects deserved a break, because they were paying a 7 percent gross production tax on the oil they produced. Bigger companies drilling new horizontal wells were only paying a 1 percent gross production tax at that time. Bingman acknowledged that the waterflood exemption had not led to development of new oil fields or created new employment. But he said the tax break was extending the productive lives of some of the state’s oldest existing wells and preserving existing jobs.